The Lions District 12-N Charities Reverse Raffle to support White Cane will be held on June 16, 2008 from 5-8 p.m. at the Fountain City Lions Club Park in Knoxville. There will also be game booths, informational displays, food, a car show, and music! Tickets are $10 each, and the selling Lions Clubs get $1 for each ticket they sell. 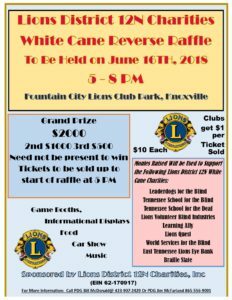 Funds raised support the following Lions District 12-N White Cane Charities: Leader Dogs for the Blind, Tennessee School for the Blind, Tennessee School for the Deaf, Lions Volunteer Blind Industries, Learning Ally, Lions Quest, World Services for the Blind, East Tennessee Lions Eye Bank, and Diabetes Awareness.